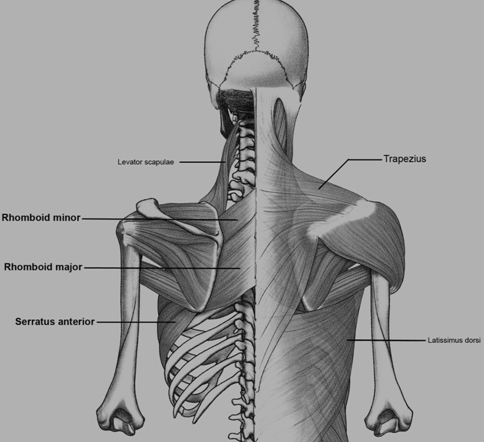 The rhomboid muscles, referred to as rhomboids, consist of rhomboid major and rhomboid minor. The rhomboids connect the scapula (shoulder blade) to the vertebrae of the spinal column. These muscles work together to keep the scapula against the rib cage as well as rotating and retracting (pull inward) the scapula toward the spine. Extend your arm across your chest with your opposite hand under your elbow. Be sure not to rotate your body as you stretch. Remember to relax into the stretch. Relax and return to starting position and repeat with the other arm. Hold for up to 90 seconds. This stretch is a gentle twist of the spine that stretches the middle and upper portions of the back. Begin on all fours, with legs spread hip-width apart and hands placed directly below shoulders. Place weight on left hand and knee, lift your right arm and let the back of your right hand glide along the floor through the space between your left knee and hand. Push your hips back and slightly to the right, bending your left arm or pushing left hand out (perpendicular to your right arm), if possible, so that your right shoulder approaches the floor. Hold the position for 20 to 30 seconds, repeat on the other side. Sit on the floor with your legs stretched out before you. Bring your right foot over your left leg and rest it on the floor by your left knee. Grab your right ankle with your right hand. Lean back and push your right elbow against your knee. As you lean back, push your right shoulder down toward the floor. Hold for 20 to 30 seconds, repeat on other side. Stand with your back straight. Cross your arms with your left arm on top of your right. Place each hand behind the opposite shoulder. Push elbows/arms together then lift your elbows/arms up to feel tension in your rhomboids. Hold the stretch for 20 to 30 seconds, repeat with right and left arm reversed. Raise your arms so they are parallel to the floor. Cross your right arm over your left. Raise your forearms so your elbows are at a 90-degree angle. Hook your right hand around your left wrist so your palms touch. Tighten your palms together and raise your elbows slightly. Hold the pose for 15 to 30 seconds. Repeat the pose with your left and right arms reversed.